You can’t open up Facebook, Instagram or Twitter without seeing one of your gym obsessed friends posting something along the lines of Go Hard or Go Home. Or even better: No Pain No Gain. While there is some underlying merit to what they are saying, these are some of the most misguided phrases used in fitness. What they imply is that if you don’t leave a workout teetering on a heart attack, your workout was useless. Kindly, I’d like to disagree. And here’s why. Yes, growth requires that we push a little further than we’ve gone before. That is, we need a stimulus of some kind to give our body (or our mind) a reason to grow, expand, or develop. Some of you may have even heard the term "Progressive Overload." The key word in that statement above is a “little” stimulus. Or "progressive" overload. Now, I understand that defining little or progressive, like everything else, is going to vary a bit from person to person. Just look at it this way - you’re not going to be adding 50lbs to your barbell squat max tomorrow. If you do, you’re most likely going to hurt yourself. You’re more likely to add 5 or 10 pounds, and even that is likely to be a struggle. That’s precisely what we want. We need just enough stimulus for our muscles to want to be better able to handle that weight the next time you train. Remember this; your body is really only out for a couple of things: procreation, balance, and survival. It likes balance because balance is safe which increases your chance of survival which increases your chance to procreate and keep the species going. When you move the dial just a bit further forward, your body is out of balance. It doesn't like this. So, it adapts (e.g., muscle growth, strength gains, etc.). That is, it wants to be better equipped next time. Push too far, and you won't adapt, you'll break. Now, we have to take this one level deeper. 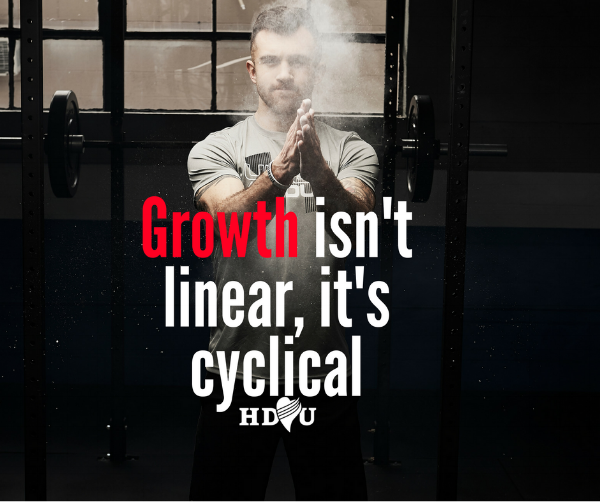 Growth isn’t linear - it’s cyclical. There are stages of growth and it works in a cycle. All too often we only focus on one stage or one phase of growth. Usually, this is the stimulus phase. The reason this is important to understand is that if we don’t have adequate time to recover from the stimulus we’ve placed on ourselves, we’ll never adapt. This is why we want to stimulate and not annihilate; it is far easier and quicker to recover. Faster recovery = faster progress. That's right, it's often not your training but in how well and quickly you recover that determines how quickly you will progress. Like many things, we want it fast, and we want it now. I get it. I operate pretty much at one speed: GO. When it comes to fitness and training, this is how we get injured. We do too much, too soon, with too little time to recover and adapt. It’s physics, after all. The more of a burden you place on your body, the more recovery time it’s going to need. This isn’t just limited to physical injury like a torn muscles. Your nervous system takes a beating too. Not only will you be sore but you’ll barely have any energy to get through the day. Isn’t part of the reason why you started on your fitness journey was to have more energy? See how things don’t quite align? Stimulate, don't annihilate. That’s the key. Just a little bit better day by day. Small consistent gains might not be the most flashy approach, but it’s the only one that works in the long term. Work hard: just a little harder than you had before. Recover harder: be the most relaxed guy or gal outside of the gym. Gosh darn I hope so! Every month I send out a Newsletter that reviews everything published from HDHU as well as EXCLUSIVE content not shared anywhere else. If you want simple solutions for more freedom, focus, and fun, you'll want to sign up below. Sign Up With This Magic Button! Woahwoahwoah Ev, why do you need my name? Because you're not your email. You're a person. I care about the person behind the email.